Recently my boyfriend and I have been arguing a lot. We are fighting because he lies to me. We never really have argued throughout the time we been together until now. And its like we fight over the same thing all the time. He feels he has to lie to me about things, because he is afraid I will get mad. He tries not to lie but it doesn’t work, he just does it. I find out eventually when he lies and I get so frustrated. We have discussed it a numerous amount of times and I am tired of hearing the same response. We don’t wanna break up but we are so tired of fighting about him lying. An example of this is he has an old high school friend he hung out with and didn’t tell me in fear I would get mad and flip out. Well I found out and did get upset because he lied, I feel like he is hiding something from me and he claims he isn’t, he just doesn’t wanna fight anymore so he lies. Do you have any advice for us? We really do love each other…. What you are experiencing is pretty common. One partner, in this case him, has a fear of anger and are extremely conflict-avoidant, so they do everything imaginable to try to avoid conflict — including the very thing that will trigger the other partner, in this case you, to get mad. When you get mad, it only reinforces his tendencies to try to avoid it again. We call it the “Vicious Circle” and in it, you are each triggering each other and keeping that circle spinning. This circle is based on old conditioning from the past that you both have. Although I cannot see it from your email, it is always the case that both partners have a part in the dance, and it could help you to try to figure out your part too. You can break through this upsetting dance. And it is destroying your relationship and love to keep dancing it. The way to break through the pattern is to make a new kind of agreement with each other. It would include elements like this: (1) agree that this pattern is really not working at all and that you each commit to change it; (2) spend some time with each other getting to the root of it… you present a basic understanding, but it is important to go further… like where does his fear of anger come from in his past… and you need to also look at and admit to him whatever your part of the dance is; (3) develop a specific vision for what each of your own personal growth would look like, were you each to break through your own part of this pattern, and share that ideal picture with each other; (4) make agreements for how to change the pattern, in terms of specific behaviors. Here is the thing. Relationship is our biggest teacher for where we each need to grow next. 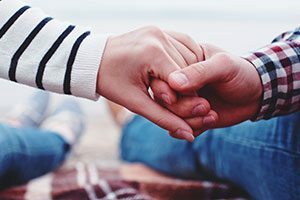 At some point, the honeymoon time in relationship is over, and it is time to do that “work” we have all heard a good relationship requires — but nobody ever explained what that work is. Most people think the work is to deny or avoid the problems that come up and pretend that they can return to the honeymoon. Well, that won’t ever work. The work is this: you each need to personally grow in some way to move through this issue. Relationship is that which forces us to grow, emotionally and mentally, if not spiritually too. These challenges either can tear you apart and weaken your love, or bring you even closer together and strengthen your love. It all depends on what you do with them.